Marty McCormack with navigator David Moynihan took an emphatic win at the Donegal Forestry Rally 2017, round three of the Irish Forestry Rally Championship. This vaults the TigerRisk Škoda Fabia R5 to the joint fourth in the championship standings with three rounds to go. Following on from a fine third overall at the British Rally Championship Pirelli Rally in Carlisle the previous weekend, hopes were high heading into the Donegal Town based event. After a number of notable withdrawals, the competition was slightly lacking, but this would not effect Marty as his aim was to gain as much testing prior to the Scottish Rally on the 20-21st of May. Marty now holds a firm 5th place overall in the British Rally Championship standings but is poised, just a handful of points away from the podium places. A good result at the Scottish event should pull the team back into title contention! 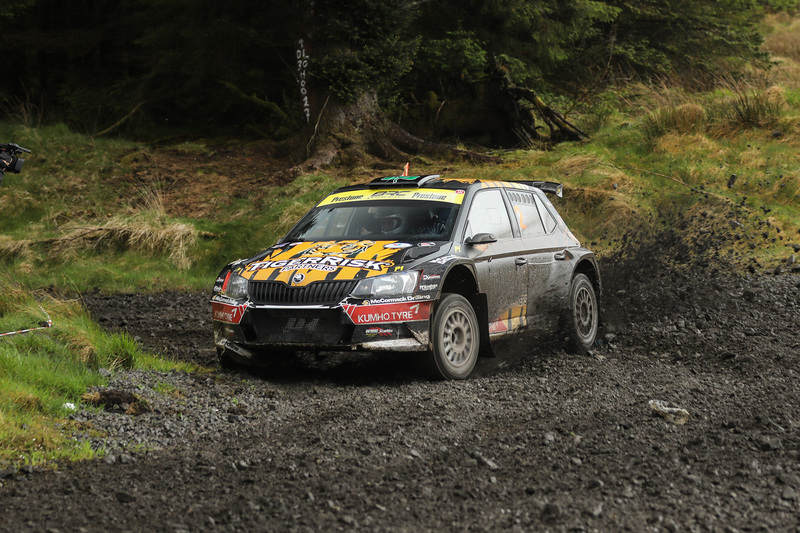 The Donegal Forestry Rally started as it was to continue, with the fastest time for the Kumho-shod Skoda over the opening test. This was followed up with another two fastest times over stages two and three before returning to service with a 19.3-second advantage over Patrick O’Brien. With only two stages remaining in the Donegal Forestry Rally, the TigerRisk car was 46.4 seconds clear in the lead of the event. It was now a case of keeping it clean and getting to the finish. The final test was a 16km blast through Tullnacarry, which was run twice. Disappointingly the first running of the stage was cancelled due to unforeseen circumstances, so this left one stage before the finish line in Donegal Town centre. Marty blasted into the final test, his last opportunity to feel comfortable with the car before the Scottish Rally. He finished the stage twenty-five seconds quicker than his nearest rival to claim the victory by over one minute ten seconds! Keep an eye on Twitter @martymccormack and on Facebook at www.facebook.com/marty.mccormack1. Marty is competing this season with the support of Tiger Risk Partners and P. McCormack and Sons Ltd.